(Newser) – Amid the buzz of his world travels, ABC brought Mitt Romney back to his old Achilles heel: taxes. Asked last night if he has ever paid less than the 13.9% rate he paid in 2010, Romney said he'd have to check his records. 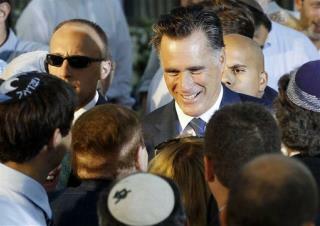 "I haven't calculated that,” Romney said in response to a question from David Muir on World News Tonight. “I’m happy to go back and look, but my view is I’ve paid all the taxes required by law. From time to time I’ve been audited as it happens, and the accounting firm which prepares my taxes has done a very thorough job to pay taxes as legally due,” he added. “I don’t pay more than are legally due. I know that I pay a very substantial amount." Romney cannot run away from this... coming out with greater transparency with respect to his taxes will either bury or exhonorate him. What is strange to me is that he must believe not coming out with it will not bury him... I think he is wrong. The real issue is not so much whether mitt paid his taxes to the US, but did he pay his membership fee to his church...that's what he's hiding, the lds will likely charge him millions for the money he's been keeping from them.